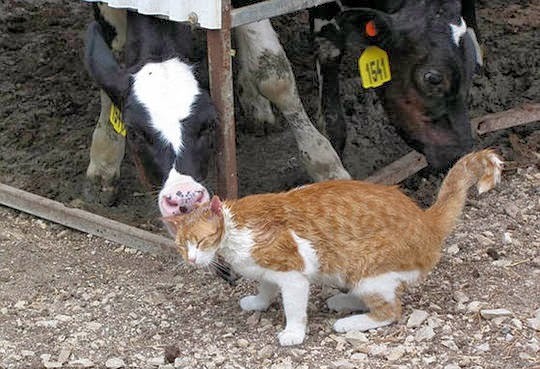 Ever since this little stray cat of Shephela, Israel, found its cow on a dairy farm, it has visited her daily. Clearly they adore each other as they are often seen giving love and affection. 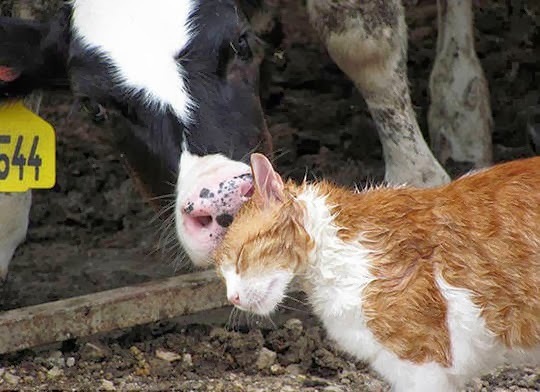 The calf's over-friendly approach might have had some cats running for the hills, but this ginger moggy was even the initiator of the friendship. 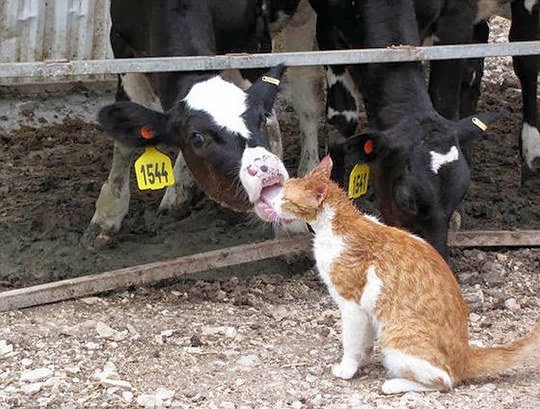 The once-dry cat often walks away from its encounter with the cow with dripping wet fur. The kitty often walks into the farm as a dry kitty but walks away with dripping wet fur. Clearly they adore each other as they are often seen giving each other love and affection. Our absolutely beautiful. Big, big smiles - thank you. Lovely. Happy Thanksgiving to you and all your family. We hope you have a swell Turkey Day. These are just adorable. Put a smile on my face. 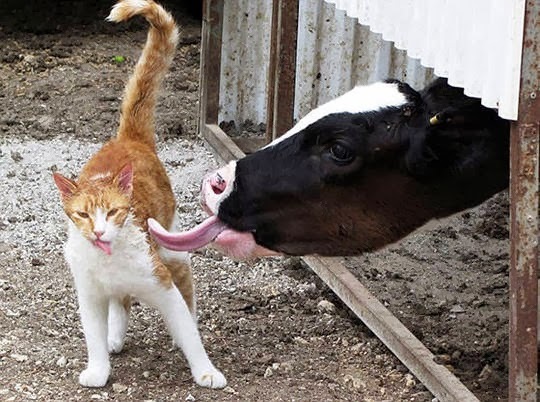 It's faster to have the cow groom him than to do it himself with his little tongue. Now that's a bath! Lovely! C'est mieux que le salon de toilette. These photos bring a smile to my face! Adorable! How cute is THAT??!!! Perfect for the 2nd night of Chanukah! C'est vraiment incroyable cette amitié. Les animaux sont souvent étonnants ! These pictures leave me with a big smile... how wonderful te see how they both like the washing! Really nice and original blog by the way. 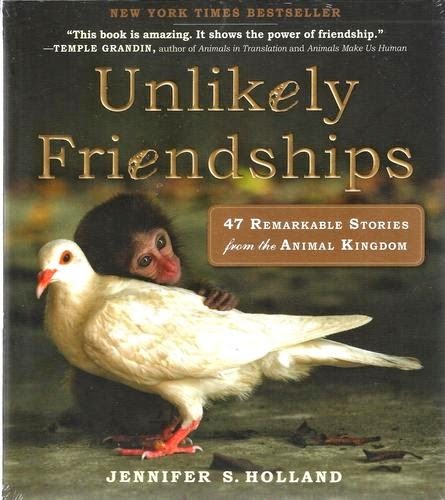 Cute, but i wonder.. Is that a beef farm or dairy farm? Will the cow be slaughtered? 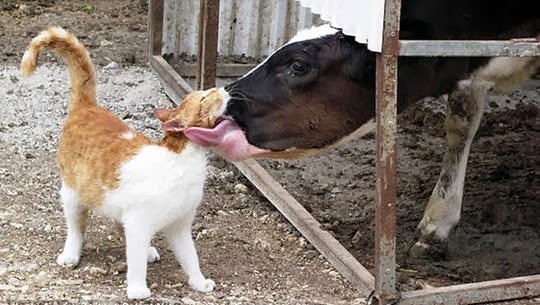 It seems the cat and the cow have a good relationship!